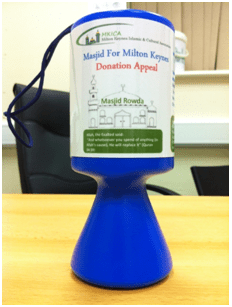 The Milton Keynes Islamic & Cultural Association is an independent charity that is entirely self funded, as such we are totally reliant on the generosity of the Muslim ummah across the globe. All of our staff from those who sit on the board of trustees to the people who clean the Masjid are unpaid volunteers. Download a Standing Order form by clicking on the button on the left and give it to your bank once you have it filled out. You can make a donation instantly for any amount you choose online, please click the donation button to the right to make a safe & secure electronic payment using your debit/credit card or a PayPal account if you have one (optional). The Masjid has a portable payment processing device available to anyone at the Masjid in person wishing to use their debit card to make a donation. It only takes a minute to process the transaction and it is a safe and secure method similar to the ones in use by shops and other businesses you see everyday. 4|37|Those who are stingy, and exhort people to stinginess, and conceal what God has given them from His bounty. We have prepared for the disbelievers a disgraceful punishment.